Informational advertising is a type of advertising, which is passive and brings long-term benefits. They don’t directly help in any buyouts, but they educate people inside out about their brand and help them to arrive at better buying conclusions. Decision-making advertising is advertising positively to influence a customer. Marketers attempting this kind of advertising usually stick to the age –old format of highlights, features, and benefits. Circle business flyers aren’t regular, which means they are rare and you can build influence over them. You can use 7.37 inch magnets to build information business flyers. As many marketers may be reluctant to deal with large circle magnets for refrigerator advertising, but that doesn’t mean that they cannot attempt at it either. They can employ such full color promotional magnets for gifting during tradeshows and various other promotional events. By investing in loyalty coupons advertisers are attempting decision making advertising. They can send customized magnets 7.37 inch for loyalty coupons. People would love to retain user guides over their refrigerator door because it comes handy to them. They can refer to it, whenever they are in dilemma or urgency or wish to clear some doubts about theirfavorite product. 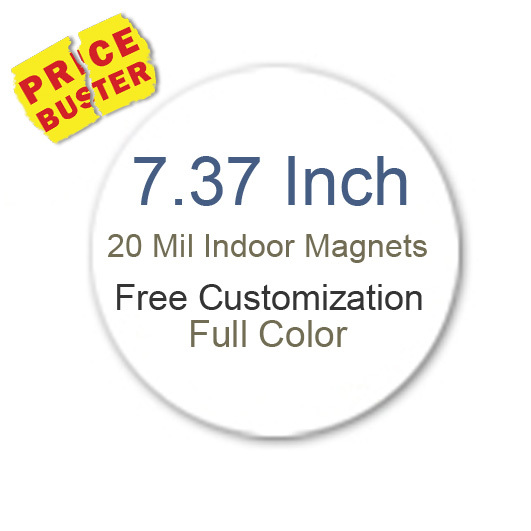 Custom 7.37 inch circle magnets announcing great savings in the form of discounts and savings will be appreciated and they are the best form of decision making advertising. Gone are the days, when people believed in every word you said about your product and blindly purchased them. Now, marketers are realizing that the best way to get closer to them is through friendly content. No wonder, many such marketers are investing in customized magnets with short and easy recipes, caution statements, calorie charts or information on customers. This type of informational advertising will bring results over a long term because a customer is not ready to take down such information from their refrigerator door. Fundraiser information can be informational type of advertising as well as decision based advertising. You can encourage people attending your tradeshow booths or sponsored community programs to invest in full color circle magnets 7.37 inch printed with social information. It will help to build your trust and improve your brand recognition. Customized circle magnets offer lots of chances for experimentation, additionally you can save on branding, shipping and full color printing.